I have to confess that I have always found Donizetti's La favorite, with its unbelievable plot and unsatisfactory characters, a strange and unsatisfying work even in its original French version. Part of this, we now realise, stems from the work's complex history, re-working chunks of a complete, but unperformed, opera L'ange de Nisida. This was long thought to be lost, or unretrievable. 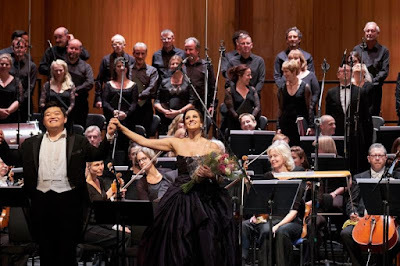 Now, thanks to determinded scholarship, Opera Rara has brought Donizetti's L'ange de Nisida to fruition, giving the opera's world premiere at Covent Garden [see my review], and now this world premiere recording with the same forces. Sir Mark Elder conducts the orchestra Royal Opera House and Royal Opera Chorus with soloists Joyce El-Khoury, David Junghoon Kim, Laurent Naouri, Vito Priante and Evgeny Stavinsky. It has to be said that L'ange de Nisida is as equally strange as La Favorite is unsatisfactory. Yet it is mature Donizetti and certainly not a trivial early work. Part of the reconstructed opera's strangeness is that it is that tricky beast, an opera semi-seria with the King's counsellor, Don Gaspar, who is one of the main engines of the plot, a pompous, self-important and funny character. 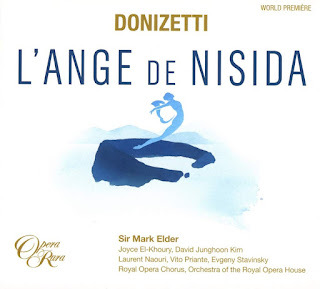 The other characters have outlines that are familiar from La Favorite, and listeners who know that opera may be disturbed by the way that sections of La Favorite go in and out of focus as the fragments of L'ange de Nisida which Donizetti re-used for the later opera appear and disappear alongside new (to us) material. There is much new music and different emphases in the plot, so it is important that we try to consider L'ange de Nisida in its own right rather than as a strange pre-echo of La Favorite. The problem with the opera isn't so much the comedy, in fact the libretto makes Don Gaspar's self importance work as part of the serious plot. No, the main problem is the unsatisfactory nature of the three other leading characters. Sylvia (Joyce El-Khoury) is well-born, yet has allowed herself to be duped by the King (Vito Priante) and become his mistress instead of his wife. She has enough firmness to rebuff the advances of Leone (David Junghoon Kim), but the whole thing shows up the King in a not very pleasant light. And Leone is simply a classic dim 19th century tenor, it takes until part of the way through Act Three before he realises what is going on. So the plot requires a lot of suspension of disbelief, yet it works because you have a strong cast and Donizetti has written some terrific music. 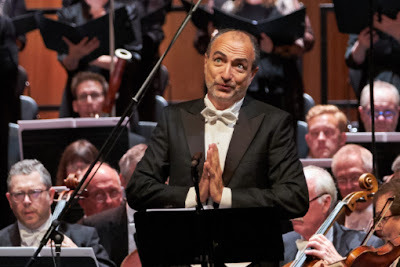 Part of the work's fascination is watching Donizetti enjoy himself with the freedom and flexibility that French opera gave him, there is only a single cavatina and cabaletta combination in the whole opera. And there are some terrific moments, most notably a series of very strong ensembles, I was particularly fond of the thunderous monks with their dramatic imprecations, and the Act Two finale is a great ensemble of confused emotions. Joyce El-Khoury makes a finely realised Sylvia, giving us a sense of her inner feelings and her strength of character. But El-Khoury's fondness for rather fragile tone is perhaps in danger of becoming a stylistic mannerism, yet there is no doubting the bravura with which she despatches Sylvia's roulades, and the fragility helps make the character believable. David Junghoon Kim is a suitably noble and firm toned Leone, singing admirably throughout with fine Italianate tones and some profoundly beautiful quiet singing. It would have been nice to get something a bit more French in style, but Kim makes an admirable and very direct hero. Vito Priante is an elegant and civilised King, albeit with a steely core determined to get his own way. There is something self-absorbed about the character, after the Act Two quartet of confusion he launches into a fine hymn to his love, Sylvia. And the opera abandons him after Act Three, the finale is devoted to Sylvia and Leone only. Laurent Naouri is a great delight as Don Gaspar, singing with great style and despatching the patter ably. You can really hear the character's ludicrous self-importance in Naouri's voice. Evgeny Stavinsky as the monk thunders wonderfully in Act Two and provides suitable religious support in Act Four. The chorus has a lot to do here, just listen to the way Donizetti uses them as a character in dialogue with Leone in Act Three (where they disabuse him of his status as the husband of the King's mistress). And the Royal Opera Chorus grasps their opportunities well. Mark Elder clearly loves and understands this music and draws playing of great style from the orchestra. The recording was made live, which gives the piece an added sense of vividness and engagement. 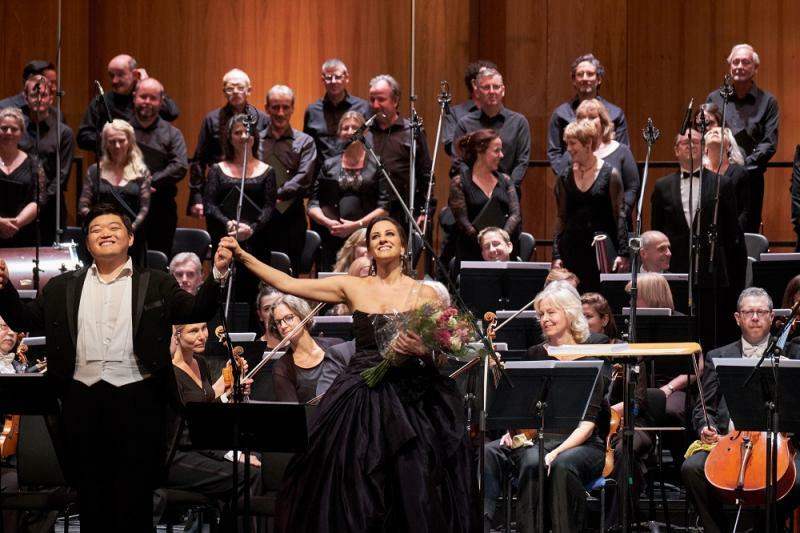 There is a lot of fascinating interest in this opera, and its presence on the boundaries of a number of Donizetti's styles gives the piece a certain status which this re-construction has admirably retrieved. This is a near ideal recording, and will let people explore this curious and intriguing piece, that sheds new light on Donizetti's final decade. The booklet is up to Opera Rara's usual standard with fine articles about the music and the process of reconstruction.